Where are the Best Programs and Places to Recycle Lights? Replacing old compact fluorescent light bulbs (CFLs) and fluorescent light strips with LED lights is an environmental and ultimately money-saving decision. The same goes for holiday lights and strands, even though you only use them for a few weeks out of a year and they continue to work. LEDs don't heat up like other types of lights, are more durable, and don't use glass, meaning you won't be shattering a few lights each year. If you decide to switch to LEDs, what do you do with those old bulbs and Christmas lights? First off, do not just carelessly discard them in the trash. Twinkle lights, CFLs, fluorescent bulbs, and incandescents should be recycled. CFLs contain mercury, and if they are not properly discarded, they can break and release small amounts of mercury into the environment. Light strands might also contain lead—which is in some polyvinyl chloride (PVC) wire coverings to make them more flexible and less likely to crack. Established light recycling programs know what to do with old, used, and even broken lights. Not sure where to go? We've tracked down places and programs that will recycle Christmas lights, incandescent light bulbs, and strings. Some offer free trade-ins or discounts on new LED holiday lights. If you can't find a store or local program that recycles lights, the Environmental Protection Agency (EPA) advises checking with a regional or state environmental regulatory agency to see if it's OK for you to put used or broken CFLs in the regular household trash. If so, seal the bulb tightly in a plastic bag and place it into the trash for the next trash collection. The EPA recommends using a local program or service for recycling lights and other materials and products because most are easy and convenient. Check with your city or local government office for information on recycling programs. Some cities offer curbside recycling programs, while others have special days or events dedicated to recycling or repurposing, like an "all-city shredding party". For more than 20 years, Earth911 has been a go-to source for recycling news and programs. Consult the site for environmental updates along with how and where to recycle lights and other household products. MOM's markets have ongoing recycle centers for items as diverse as shoes, denim, cork, and food squeeze pouches. An annual holiday light recycling event is held in winter; dates vary from store to store. Recycling those hard-to-handle 8-foot-long fluorescent tube lights is a smoother and easier task with Bulbcycle. They'll send you a box or container for the specific light you want to discard, for a fee. Bulbcycle also recycles batteries and smoke detectors, among other products. Holiday LEDs accepts holiday lights and strands throughout the year—not just at Christmas time. They request that you package the lights carefully and send them to their Wisconsin headquarters. When the lights arrive, they are removed from packaging and the lights will be processed. Any materials that can't be recycled is discarded. 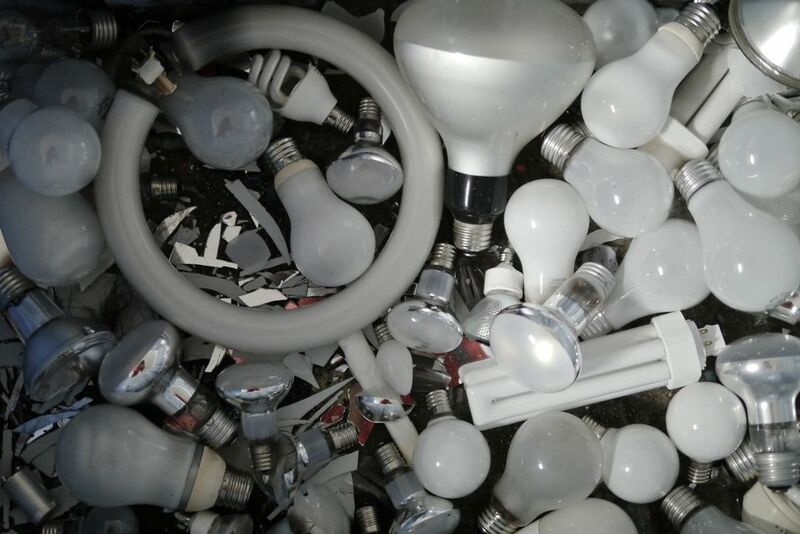 lights are taken to a third-party recycling facility in Jackson, Mississippi, where they are chopped into small pieces. The pieces are sorted and taken to a regional center for further processing. Send in your old incandescent Christmas lights for recycling, and HolidayLEDs.com will send you a coupon for 15 percent off LED Christmas lights ordered from its site. If you send your unwrapped strings of old incandescent holiday lights to LED Warehouse, they'll recycle them and give you a coupon for 10 percent off their LED light products. Simple Cycle is the national mail-in program offered by LEI. Lamp and light shipping containers are available in various sizes. Use LampMaster to order boxes, then pack and ship them to predetermined recycling centers. The services recycles various shapes and sizes of fluorescent lamps, CFLs, LEDs, HID/Metal Halides, and other types of lights/lamps. Use LampRecycle's interactive map of the United States to find a light recycling program in your state. Programs and laws change periodically—check for updates.